Yvon Dionne has been retired since 1997. An economist by training (Université de Montréal), he worked at the Bank of Canada (11 years) and for "our" Quebec government (20 years). On March 2, the Obama Channel (CNN) quoted an Obama activist comparing the new president to Robin Hood, and capitalism to a system designed to rob the poor. One thing is certain: a system of Robin Hoods designed to rob those who own something will end up making most people poorer, through a lack of investment, lack of employment, and the absence of freedom. We are observing these days the worst theft in history, with trillions of dollars being wasted, trillions that will feed inflation and higher taxes and only benefit the rent seekers and government bureaucrats. 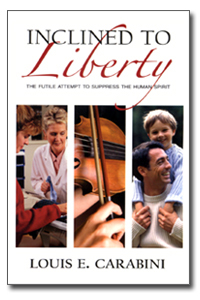 I received a little book (110 pages) entitled: Inclined to Liberty―the futile attempt to suppress the human spirit, by Mr. Louis E. Carabini (published by the Ludwig von Mises Institute). He dedicated the book to me as follows: "Yvon: to the sacrosanctity of life and the joy and benefits of liberty." The book originated from a discussion at a dinner party in Louis Carabini's home in California. At that party, social planners and would-be regulators complained about inequality and stated that the poor are poor because others are rich. Underlying this statement is the notion that the rich become richer only by exploiting the poor, and that there is a finite amount of wealth in the world. This is a notion borrowed from Marxism, and we know the results of applied Marxism. • a never-ending avalanche of laws and regulations adds excessive costs to everything we do. The common answer from politicians and defenders of Statism is that they need more funds to cure the problems they have themselves created. The set of services (plus the redistribution system) that the State has monopolized is like a barrel full of holes. This non-market economy is unable to reduce its costs in real terms (in contrast with private producers of computers, cars, and so on), per unit of output (assuming consumers would still buy a pair of shoes that only fit one foot size, as we have seen in the planned economy of the former Soviet Union). What many might imagine the State does well is always costly, in terms of dollars and/or freedom. If it had not been for the struggling, semi-capitalist economy, striving under forced redistribution and decreed choices without competition, the State would have in fact made the poor poorer, to the benefit not of those who provide capital and employment, but to the benefit of myriad government parasites, from politicians to bureaucrats, from unions to corporations who lobby for more and more grants. The above are my own words summarizing Mr. Carabini's book. In a chapter entitled "The False Lure of Democracy," Mr. Carabini begins with a quote from Giordano Bruno, who was tortured and burned by the Inquisition in 1600: "It is more blessed to be wise in truth in face of opinion than to be wise in opinion in face of truth." "The common answer from politicians and defenders of Statism is that they need more funds to cure the problems they have themselves created. The set of services (plus the redistribution system) that the State has monopolized is like a barrel full of holes." • If the U.S. government printed and distributed $1 million to every household in the country [...] would we all live better lives? (p. 39) A good question. This is exactly what governments are doing right now. Now, the Big Question: What about the Future? Communists, and in general all collectivists and social or climate planners, proceed from the same starting point: they have the Faith, and they don't mind imposing their choices upon others. In Marxism, historical materialism made the advent of a communist Paradise inevitable. However, it was necessary to transition through a dictatorship (said of the Proletariat, but in fact of the new ruling class). They did not mind killing all their opponents or shipping them in cattle rail cars to concentration camps. In non-communist democracies, governments are more subtle. They allow you to disagree as long as you obey the laws. Freedom, it is said, is inevitable because it is a necessity of life. While I agree with the necessity of life, we must however observe that since the beginnings of humanity history there has been a cavalcade of horrors, murders, torture, atrocities. Despite the many discoveries and the growth of knowledge, the few steps taken to introduce freedom within a system of government (of minimum government) have been dwarfed by greater and greater steps toward the Brave New World that all social planners dream of, using coercion most of the time. In other words, it is hard to feel free when everything around us makes us into slaves. Although Mr. Carabini has deep thoughts about freedom, I have some doubts about the first part of the last sentence in his book: "Liberty is a state of mind." Liberty is not a metaphysical notion. When governments at all levels already control about half of GDP, and manipulate most of the rest of the economy through laws and regulations, it appears that liberty becomes more and more a state of mind and less and less an issue for the minds of the statists. Let's make liberty real. SUBSCRIBE TO QL • WHO ARE WE? • LE BLOGUE DU QL • REPRINT POLICY • COMMENTS? QUESTIONS?